An important ingredient in one of the national dishes, Paella, is saffron. The place of origin for the "real" Spanish paella is in Valencia. According to a friend from the region it should contain rabbit meat and snails. In addition it has to be prepared in water from Valencia. Well, sometimes its difficult to get hold of rabbit meat. And its even more difficult to find water from Valencia. There are many different rice dishes which has developed from the original recipe. 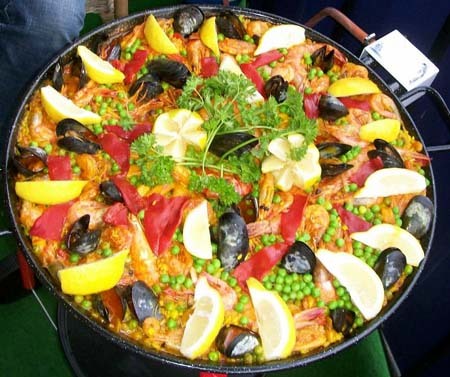 Below is a Seafood Paella. This recipe is from another friend of mine, Eva-Helena Holmberg-Lascaray. If you don't find all the ingredients, try to experiment a little. If you want to make it a bit more luxurious, why not add lobster for example. After Eva-Helenas recipe there are other suggestions. Do you have your own favorite? Please mail me! 6 cups of fish broth, preferably homemade. 1 small jar of red peppers, cut lengthwise for garnish. 1,5 pounds langoustines, peeled but head and tail on. Make the fish-broth (mix water, fish bones, chopped onion, carrots, parsley, 1 bay leaf and salt and pepper) Cook for 15 minutes. Clean the squid and cut in stripes. Season. Cover and save. Put the mussels and the clams in a pan and cook until open. Discard the shells that has not opened. Cover. In a paella pan, (see picture below) Heat the olive oil. Add the chopped onion, green and red pepper. When half soft add garlic and tomatoes. Sauté until tender. Season. Add the rice and cook for a moment. Add the hot fish-broth (6 cups), saffron and food coloring. After 10 minutes incorporate the squid. 5 minutes before the rice is done add the langoustines, the mussels, clams and the red pepper from the jar. When rice is done, decorate with the lemon wedges and the peas. Cover with a kitchen towel for 5 minutes before serving. 1 -2 pounds of chicken, cut in smaller pieces. 3,5 - 7 ounces chorizo, in slices. Replace the fish-broth with chicken-broth. Follow the recipe above, but start with frying the meat until it takes nice color. Season with salt and pepper. Put it on a separate plate. Continue with the onion, peppers, garlic and tomatoes. When tender add the meat again together with the vegetables. Then add rice and the chicken- broth. Chop one onion. Melt butter or olive oil in a saucepan. Add the finely chopped onion and sauté until onion is soft. Add some saffron, salt and the rice. Use chicken-broth instead of regular water. Make it boil. Cover, lower the heat and boil during approx. 20 minutes.